Spring is coming. Time to prepare for winter. As the northern hemisphere marches toward spring, my thoughts turn to winter. Future winters, that is. Our yearly household heating is done almost entirely by wood, with some minor backup and space heating augmented with electricity. This dominance of these options may exchange when the ITER project begins to supply cheap, clean electricity in Europe. But since I have little expectations the local village will provide natural gas lines near our home before 2050, wood or electricity are really the only two reasonable heating options currently available in the foreseeable future. Green, freshly cut wood as delivered. Thus the ending of each winter means the preparing for the next winters by ordering a little bit of wood to replace what of our supply we depleted in the foregoing months by keeping hearth and home warm. And by a little bit of wood, I mean eight tons. I use to get sawn to stove size, but unsplit. 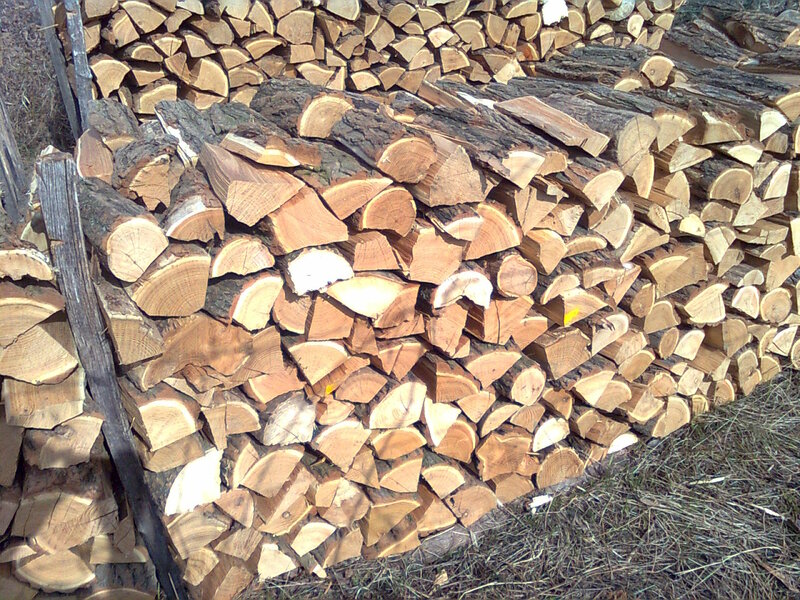 But in the past few years I have gone with sawn and pre-split so I can get right to stacking for a simple reason: no matter how it arrives, the main issue to consider is that the sooner the wood is cut, split and stacked for drying the better. I have used wood heating for a good part of my life, as it was a major form of heating even long before I moved to Europe. And a major mistake some people make on either continent is to burn green, or still wet, wood. A great deal of wood weight, when a tree is freshly felled, is water. And it takes a while for that water to leave the wood and for the wood to become dry enough for efficient burning. If you see a lot of smoke coming from a chimney for an extended period of time beyond a normal 15 minute start-up time, that person is probably burning green wood. 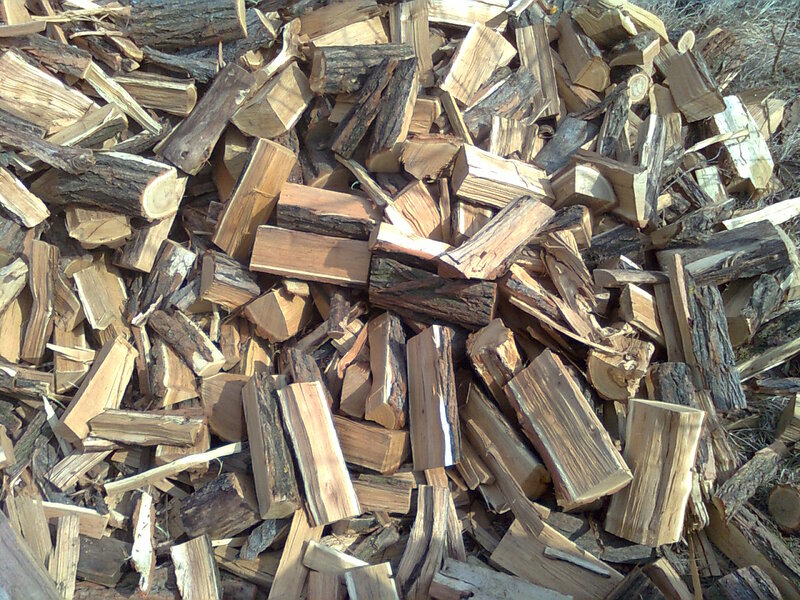 It is highly inefficient to burn green wood as most of the energy of the combustion process is used in evaporating the water, not heating the interior home space, which is a waste of money as well. Burning green wood is bad for a wood burning appliance, and it will also contribute to clogging a chimney with creosote deposits. Green wood will send excessive particulate pollutants out the chimney as a health hazard to everyone outside. So properly drying wood is not only a good investment in not destroying expensive stoves and chimneys, but you are also doing a good deed by not polluting your neighbors and neighborhood. So on to the stacking. Stacking all of those eight tons. Line stacking between posts with wood all stacked in the same direction. Difference of opinion exist how to best stack wood. Some do a simple line stacking with all logs laying in the same direction. 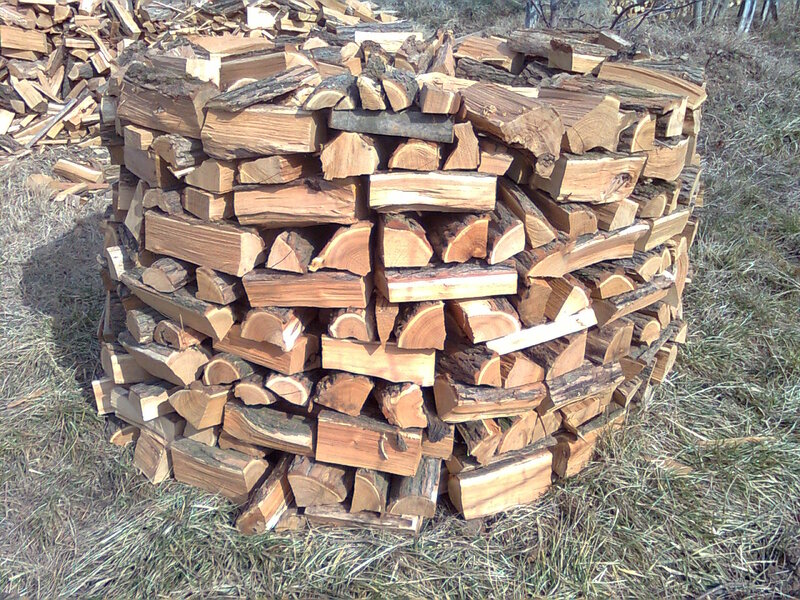 Others say only an alternating 90° change at each layer of stacking will best dry the wood. Stacking in the round with a 90° alteration in wood orientation between layers to provide more airflow. But no matter what type of stacking used, we have to get that wood down to no more than 20% moisture content for ideal burning and heat generation. Drying can take up to two years for most wood, and four years for oak. For the firewood, I order mostly Black Locust (Robinia pseudoacacia), which is a north American tree species most famous for being what Abraham Lincoln spent his early life splitting into rails and fence posts. Black Locust has found its second home in Hungary where it is known as White Acacia (even though it is not an acacia as one can see from its species name: pseudoacacia, or “false acacia”). Black Locust is so well adapted to the local climate and grown so extensively in some areas it makes up entire forests in Hungary. It is also the “acacia” in local Hungarian acacia honey. Black Locust is also known as American Ironwood in the US for a good reason: it is extremely hard and very highly rot resistant due to flavonoids in the heartwood. Black Locust posts can last 100 years in the soil. Which is why it can be placed directly into the earth without treating the wood for use for fence posts, playground tools, and wine cordon posts in our vineyard. And as a fire wood, when properly dried, it has the energy density similar to anthracite coal. By warming our home in the stove, and by helping in the vineyard to make wine which warms our hearts, Black Locust may be the most perfect wood.